Which entry method should you use? The Plus card "S/E bar" and “modify” dialog are the easiest ways to enter card S/E for you or others. Plus supports both entry methods in all Plus "sync" modes. For those using sync by "Trello card comments" (the recommended sync method), Plus supports a third entry method: adding a special card comment from any browser or the Trello mobile app. That third method, adding a card comment, is what the other two methods actually do when using sync by "Trello card comments" and you will see the comments entered whenever you use the Plus card "S/E bar" and “modify”. The comment allows other team members to access the new Plus data in their Plus extension or Plus mobile app and power-up. If you are using another sync method (based on Google spreadsheets, or sync is off) the rest of this guide is not for you. Go check our Plus help board. Advanced users may enter such "S/E comments" directly too, which supports more features and special commands. What additional features are supported with this method? Each S/E entered generates a "S/E row", the basis for making all Plus reports and burn-downs. Adds 2days ago 5/3 with note "prepare pdf". Adds to john 6 estimated units. Adds to john, paul and you 2days ago 3/3. Relaxed format (no backslash). Adds 5/0, or 5/5 if the card is recurring [R]. Transfers 3 from global to paul. The note must start with ^etransfer to be a transfer command, otherwise it will add 3 to both user estimates. Adds a burndown annotation "QA begin" for today. You can also just start a note with "!" in the S/E bar to make an annotation. Re-reads this card's s/e comments (after you modified or deleted them). "plus!" is the default keyword. You can change it to another keyword (or several separated by comma) in Plus help. Your custom keywords do not have to end with "!". Anything between [brackets] is optional. Do not type the actual brackets. x is the number of days that it happened in the past followed immediately by d without spaces. Zero s or e are optional. Always include the slash /. The "plus!" keyword can be changed in Plus help to anything you want. Currently when using this "colon" format, Plus converts it to decimal in the card comment and reports, as in "1:30" becomes "1.5" which is equivalent. That will be improved soon to show in the original format entered (colon or decimal)..
★ Relaxed format - no "/" or "e"
With this method, E is deduced based on whether the card was recurring at the time the S/E was entered. This is an important detail, because if you enter S/E rows with relaxed format and later change the card Recurring status, only new S/E entered will use the new status, even if you reset sync. Like basic format, except users go right after the keyword. Enters the given s/e as if user1 entered it. You may mention multiple users in a single card comment. Just @mention users after the keyword and before the optional -xd. This impersonation format also works with relaxed format. Whenever impersonation is used, Plus will always add special text to the row note, like "[by theActualUser]". These notes cannot be tampered and provide a secure way to identify all rows that were impersonated. Normally, only a manager would impersonate other users. To make a transfer, there must always be two users (from to), S must be blank or zero, E must be positive, and the note must start with "^etransfer". This command always transfers from the "1st estimate". See more about transfers. To include yourself in the S/E row, @mention yourself or use @me which Plus provides as a shortcut since Trello does not auto-complete you. "Multiple users in a single S/E comment" is the only feature available using direct card comments that cannot be entered with the Plus card S/E bar. This feature uses a single card comment to generate many S/E rows (one per user mentioned). plus! 0/0 !QA start adds an annotation named "QA start". Any s/e with a note starting with "!" is an annotation. Add these annotations as card comments, or using the Plus card s/e bar which makes it easier to enter past annotations (simply select "other" from the date selector). Change your keywords to anything you want from Plus help. They do not need to end with "!". The first keyword is used by the Plus card bar by default. Each S/E card comment starts with a single keyword. You may want a different keyword per team so their shared board's history won't mix with other teams. Once you add multiple keywords (not counting the special legacy "plus s/e" keyword) the Plus s/e card bar lets you pick a keyword. Reports also let you filter and group by keyword once you enable multiple keywords. If you change your keywords and those were used in past comments, "Reset sync" to pick those up. Legacy users (before 12-Dec-2014) need to also add the keyword "plus s/e" to their keyword list so Plus can read past S/E history. A typical keyword list for a legacy user is "plus!, plus s/e". To modify total s/e, use "modify". It will enter more s/e rows. Do not modify existing Trello card comments directly. If you do, Plus will not detect those changes until you issue a card "reset sync" command (see the next section). When using "modify" Plus will do the math and enter the needed S/E row to make the totals like you specify. You can also enter those "delta" s/e rows directly using the card s/e bar or a direct Trello card comment. The only way to modify a 1st estimate is to edit the corresponding card comment in Trello, then issue a special command. This can only be done with the default sync mode sync by card comments. Other S/E besides the 1st estimate can be modified using "modify" in the card front report or with the method above. set an optional note without the [brackets]. This will cause all card S/E to be re-read for you and all board members using that keyword ("plus!" in this example). You can also use this to modify or remove incorrect S/E rows. Any existing s/e for that card will be set to 0/0 and the original s/e values set in the row note. All comments will be read again for that card. The oldest row per user (that is not 0/0) will become the new 1st estimate. Reports will show a yellow row indicating that a ^resetsync was performed by a given user. The command should be used only as a way to correct typing mistakes. To change your current spent or estimate simply use the "modify" dialog or enter an S/E card comment which will keep your 1st estimate intact and update your current estimate. This allows you to later analyze changed estimates from reports. Plus has full S/E traceability with reports to see who changed what and what, including modification of a 1st Estimate. Estimate modifications can only be made with the sync mode "sync by card comments". 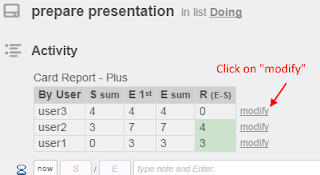 To watch for estimate modifications in general, make sure to make reports grouped by "s/e rows". In those reports you can watch for estimate modifications (negative E) or with the "E. type" filter. To watch for 1st estimate modifications, the only way to do so is to modify the Trello card comment that corresponds to that 1st estimate, and then issue a ^resetsync on that card, both of which can be done by the user that entered the 1st estimate. If you let users enter their own 1st estimates, watch the "New S/E" for yellow rows indicating a "resetsync" was performed, or do a report anytime to search for S/E rows with note containing "[^resetsync". Bookmark it in Chrome for reuse. To prevent users from modifying their 1st estimate, set yourself their 1st estimate (pick each user in the s/e bar). Since the card comment is made by you, Trello only allows you to edit or delete it. Keep in mind that S/E rows with the original S/E values are only kept in the notes of the modified rows, and those old notes can later get lost if you do a full "Reset Sync" from Plus help:Utilities because Trello does not keep comment modifications in their card history. Rate Plus at the store!